Knight & Beard is a fantasy buddy comedy about an angry young girl who wants to be a hero and a sensitive man who hates conflict. This series is co-created with my creative partner, Sarah Bollinger. Issue Eight's script, layouts, pencils, inks, and colors are done by myself. 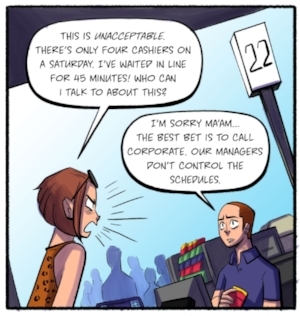 Comic created for The Nib about my experience working at a midwestern grocery chain. Click on the image below to read. Girls Have A Blog is an auto-bio comic co-created by myself and my creative partner, Sarah Bollinger. It archives our life growing up as young adults and best friends. This strip is contracted through the company Line Webtoon and is designed for their mobile app.